Writers’ Trigger: Today, I write in praise of notebooks. 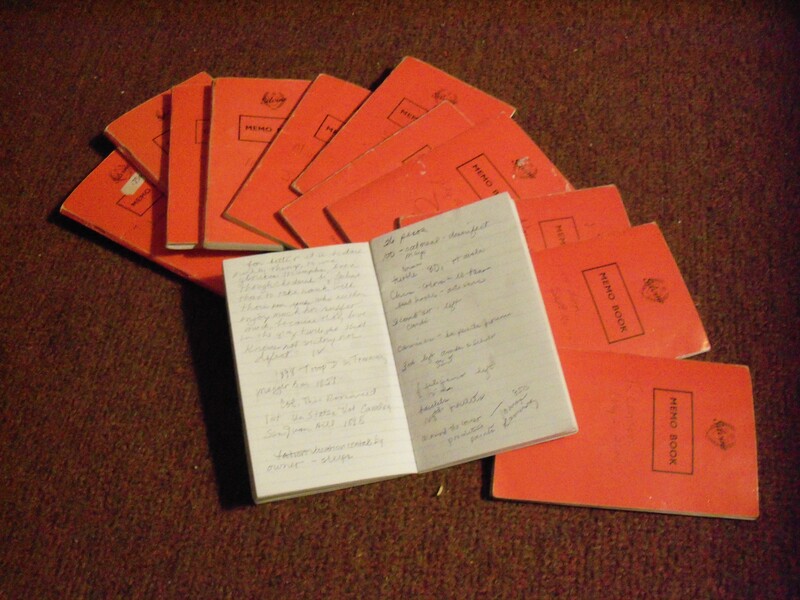 I have used the same kind of notebook for so many years, that my 4 by 6 inch orange notebook has become a fixture. The size is perfect. I usually keep it in my purse, but it fits equally well in a jeans or coat pocket. I never leave home without it. Just to give you an idea of the range of topics, I’ll transcribe some partial entries in sequence. It is not important for you to know the context. Some of the entries are quite abbreviated. The point is to share the range of entries and by doing so, convince you of the boundless triggers at your fingertips if you just keep a notebook. hot pink shoes, red and rust flouncy dress, expensive tan, long pink nails, hot pink sunglasses, blonde hair. Is she a he, or is she a harden woman? Crimes of passion – collect news reports of crimes of passion. Start with the crime and then invent the back story. www.art.tfl.gov.uk – A listing of 800 dreams reported by Jubilee customers. St. Martin’s – Could be that the vertical and horizontal lines which are closer together in the center of the window suggest a cross. For me, the cross aspect is an after-thought. My eye is immediately drawn to the oval hole in the center of the intersecting lines. Look up the Transcendentalists. Emerson and Thoreau. John Gillett – “The oldest, the noblest, the most straightforward and readily understood of the purposes for public art: to provide a marker; to bring people together; to make people proud.” link to Christo over the River Project and bring in Hickenlooper’s campaign as to the benefits. “Fall” by Edward Hirsch- Everything / changes and moves in a split second between summer’s sprawling past and winter’s hard revision, one moment / pulling out of the station on schedule, / another moment arriving at the next platform. See Winter’s Bone. Connect to hunting and eating squirrel as a kid. St. Paul’s audio guide – beginning with the Korean War, the tendency has been to move away from glorification of the military commander/hero – quite the opposite of glorifying war. War is a failure in that dialogue failed and the result was war. London style: Short shorts over opaque tights and either ballet flats or elf boots or Cavalier boots – soft black leather flaring up over the knee cap. Buy David Sedaris Squirrel Seeks Chipmunk. grapefruit juice, bug light, cabbage, four bags of mushroom compost. Remind the girls that I’ve put rat bait in the Taurus. Cattails going to seed… leaves olive and copper and rust. Bronze, olive, and gold. Blue Spruce and green Ponderosa. Milkweed pods open. I remember collecting milkweed silk for life jackets during the war. True? research link to Monarch butterflies. Albacore the only dolphin-safe tuna. Try to find a used copy of O’Keeffee at Abiquiu, photographs by Myron Wood, text by Christine Patten, 1995. Sweetwater Wetlands in Tucson. The Santa Cruz water-table – 30 ft in 1940; 80 ft in 1960; more than 100 ft in 1998. Wilcox Apples – bruised, unwaxed, not Snow White Red, not genetically modified for long shelf-life. Absolutely the best apples I’ve ever tasted. from Cuentame – www.landofopportunitymovie.org. re: stereotypes of undocumented workers. Keeping a journal is good, but if you keep a notebook, you’ll have no end of triggers to jumpstart your morning pages.